I hope this Friday finds you well. 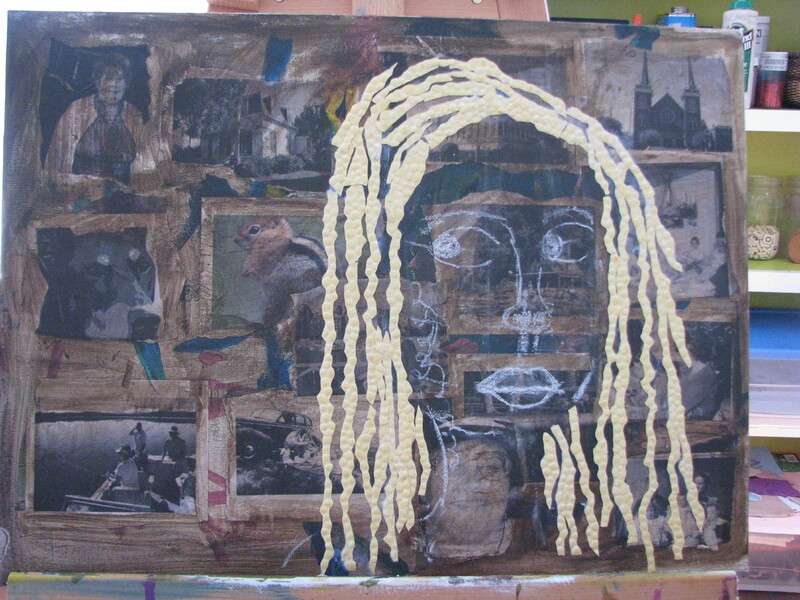 I am so excited about the painting that I am doing and am just waiting for some words to find me. I started looking for words and realized that I just need patience. 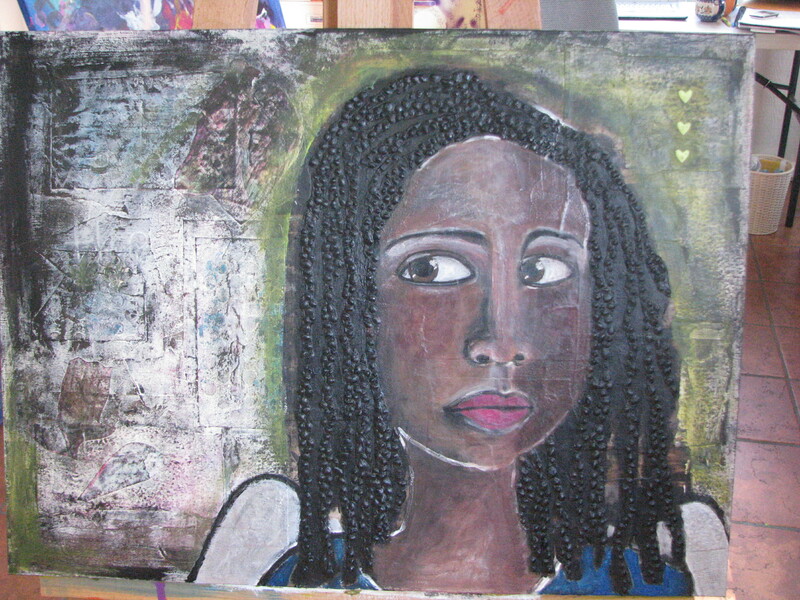 I started 2 new paintings this week. And the one I am going to show you is the one that grabbed me yesterday and I painted like fire all day. I started out painting on an old canvas of MMMM’s from when she was one. It is 16 x 20 inches. I printed out mostly black and white photos of my past and applied them with Golden Gel. The pictures are a little random. I have my grandmother and parents which would be expected. But then I have a golden chipmunk from our cabin in Lake of the Woods, Oregon. The catholic church in Red Bluff, because I have wanted to be Catholic since I was 5 when my best friend Carol got to go to catechism classes on Saturday and I had to stay home. I just went with my intuition and as you will see, it doesn’t matter in the end, because I cover it all up. When I really got excited and couldn’t paint fast enough was when I saw this bubbly paper in my paper drawer and saw her hair. I cut it into strips, put it on with gel medium and voilà! I love it. I painted her hair with my favorite Golden Mars Black. It is such a rich and mat color. She has a small nose, because in the beginning, she was a child. I covered the pictures with paper. Some ripped and some cut with scissors. The skin color is equal parts cadmium red and yellow oxide, with a little blue to make it a richer brown. She is almost done. Just a little tending and she is waiting for words. You can see she is waiting expectantly. And she is willing to make a deal. 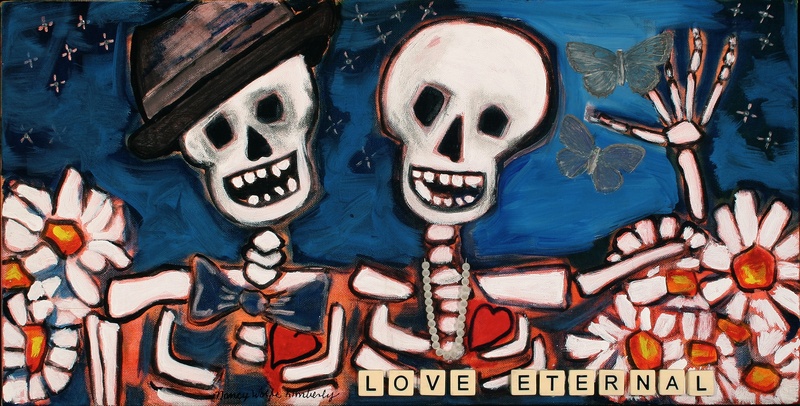 If I use your words on the painting, I will send you a free print from my ETSY site. 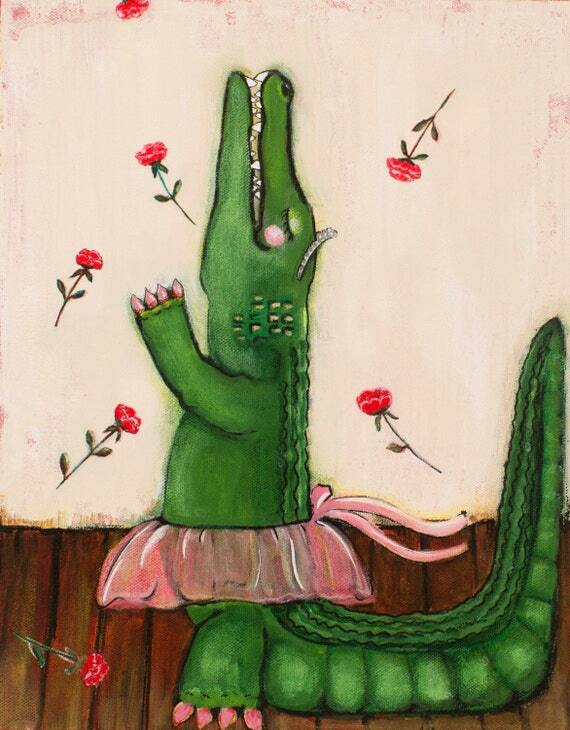 Gator Girl Art is on Etsy! If you would like an original Gator Girl painting, but need to wait a while for the opportunity, there are prints available on Etsy. My prints start at $30 and there is a special going on for the month of April. Go ahead and check it out. You can also send me your email address through my email account at nancy@gatorgirlart.com and I will send you an email when I have a new painting, OR you can also see all my paintings in progress by following my blog. And thank you, thank you for reading my blog! I have completed 3 paintings. 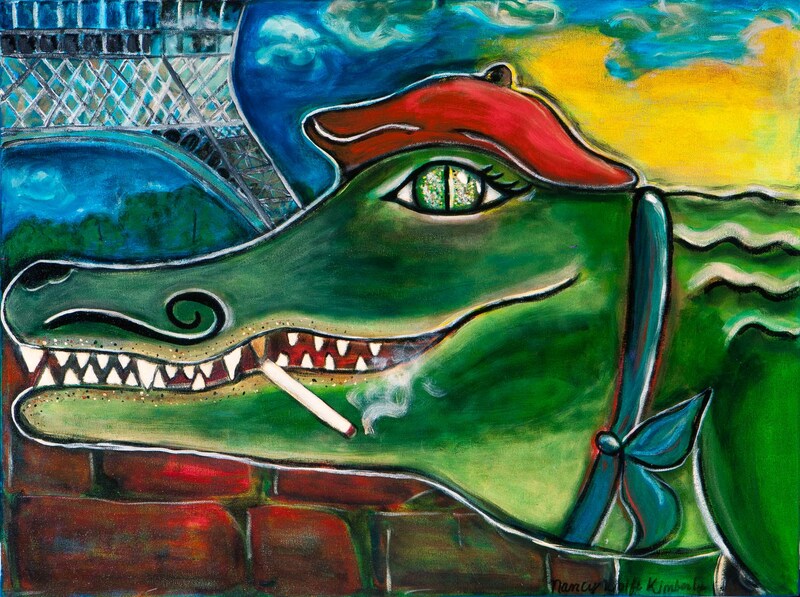 The original of Monsieur Gator was painted on commission and is not available. The collector asked for a French Gator. Painted in French around the outside edge of the canvas are the words “Strolling at Sunset, Dreaming of z Camembert”. I listened to Chante France on the Internet. M. Gator loved the music. It seemed to put him in the mood for a portrait. What an attitude he has! 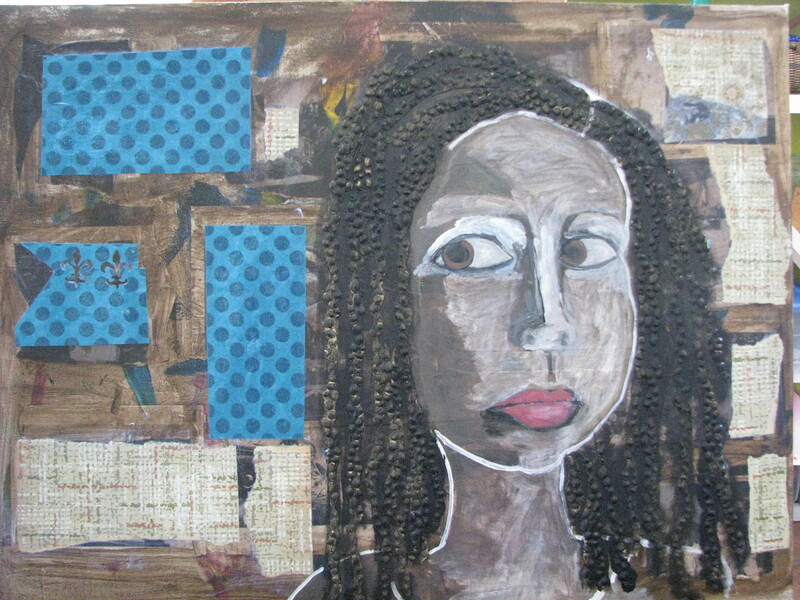 La Femme Fatal is mixed media, 12 x 36 inches painted on wood. She is standing on the street in the French Quarter after the parades have passed. She still has “it” after all these years. She sells for $800. There are words about Mardi Gras running through her hair, and a 3 dimensional king cake baby. She is wearing a raven mask for my sister who owns Raven Wisdom Studio in Chico, California. (She is a clay artist.) The music is from the song “Mardi Gras Mambo”. 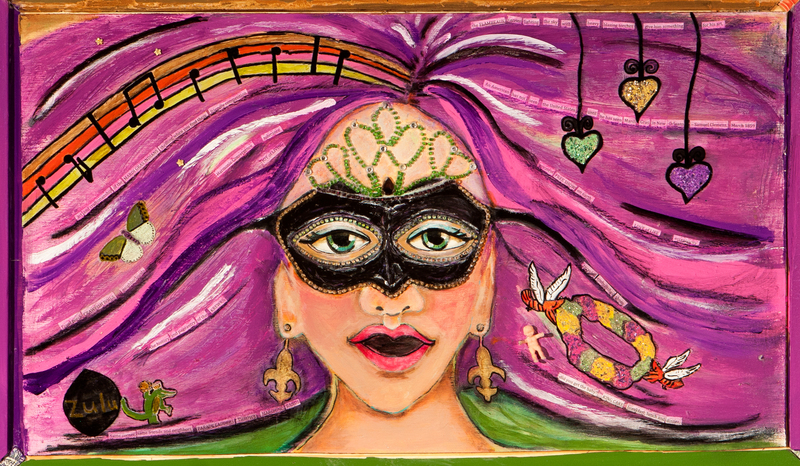 Mardi Gras Muse started out clearly in my mind’s eye, but took over a month to complete. Now that these 3 paintings are complete, I will be starting a new painting from scratch. The options are swirling around me as I type. *The photography is by the amazing Dorka Photography in New Orleans.